Today's Wednesday...you know what that means: REMIX!! 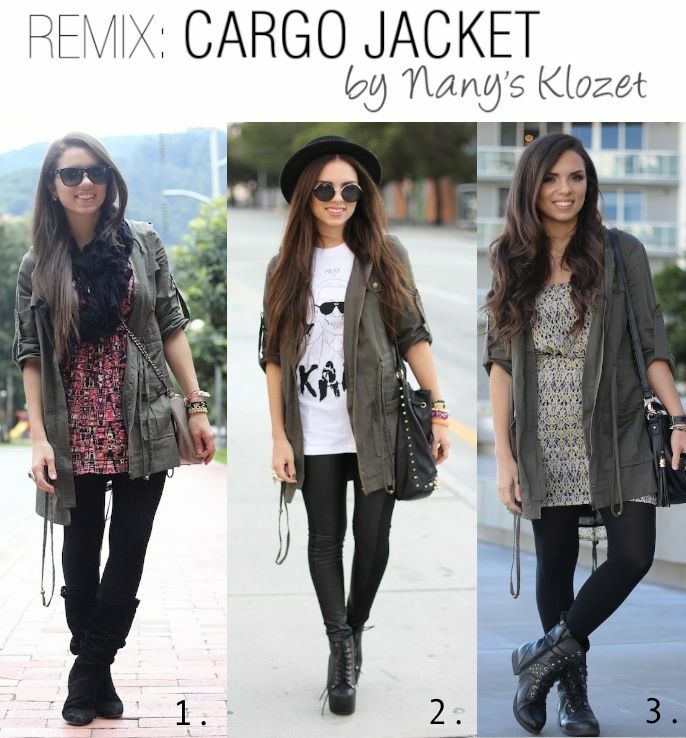 Today I'm showing you three different ways I have worn my cargo jacket. If I'm totally honest with you, I wish it was a little bit shorter- that way I could use it with more items in my closet. However, I actually like the length when it's paired with dresses (look #1 and #3). I've always worn it on chilly days since it's the perfect layering piece. I still have a couple of looks in mind with it... maybe I'll get it hemmed.. what do you think? should I? Which look is your favorite? Y hoy es... ¡miércoles de REMIX! Hoy les muestro 3 formas como he utilizado mi chaqueta cargo. Si les soy totalmente sincera, muchas veces quisiera que fuese más corta porque así pudiese usarla con shorts/faldas/pantalones. Pero al mismo tiempo me gusta mucho que es el largo queda perfecto con vestidos como el los looks #1 y #3. La he utilizado solo en días fríos con diferentes tipos de botas y medias pantys o leggings. Todavía tengo varios looks en mente con esta chaqueta...y tal vez terminé mandándola a arreglar para que sea más cortita... ¿qué opinan? ¿qué look es tu favorito? Pd: la mia es de Sugarlips pero se agotó hace mucho. Aquí les dejo algunas opciones. I love your third look! love to see your remixes, Nanny. the cargo jacket seems to be such a multi-use piece! You look great. I always like all your remixes! I'm loving the military trend here!